This outstanding circular walk of 100 miles in length, starts and finishes in Horton-in-Ribblesdale, and encompasses the major dales and outer fells of the Yorkshire Dales National Park. Parking at our secure premises in Kirkby Malham and personal transport to and from Horton in Ribblesdale. This outstanding circular walk of 100 miles in length, starts and finishes in Horton-in-Ribblesdale, and encompasses the major dales and outer fells of the Yorkshire Dales National Park. With a total ascent of some 16,000 feet of Yorkshires best known peaks, wild moorland, and fine walking country of the Howgills, including a visit to England’s highest inn at Tan Hill, 1,732 feet, it makes for a challenging and rewarding journey for the experienced walker, with plenty of stamina. Even if you are an experienced long distance walker, it is advisable to take a companion, be physically fit, and suitably equipped, with boots, which are well broken-in. You will require a “day-bag” containing items of dry clothing, waterproofs, food for the day, and liquid refreshments, since this walk “gets well away from it all”. 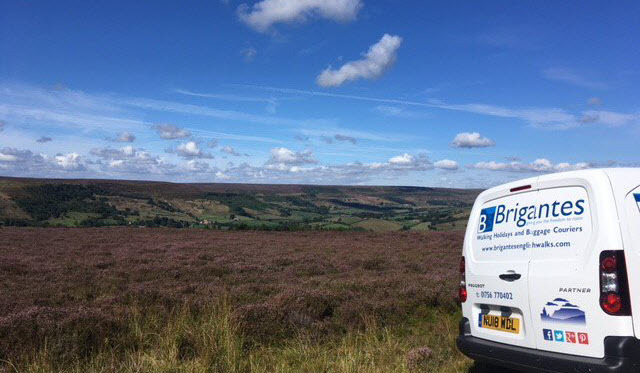 The assistance of the Brigantes Baggage Courier service will enable you to have all your dry changes of clothing and other creature comforts available for your use, when you arrive at your destination at the end of each day. The route is not waymarked, so ideally you will need to obtain a copy of the (now out of print) “Official Guide Book to the Yorkshire Dales Centurion Walk” by Jonathan Ginesi, published by John Siddall (Printers) Ltd. Guides to download, based on the book, are available free (to members) from the LDWA’s website. Walked this in july 2018, was a great walk, superb scenery, was quite a tough walk thou, 20.087 feet of ascent, although some of the hills can be bypassed if you prefer, all the accommodation was excellent many thanks to brigantes for organising this, thanks. Looks a great walk through the different dales and much diversity to absorb. The short film show is excellent and the standard of photography is clinical. We are thinking of doing it this summer and we found the info very useful.